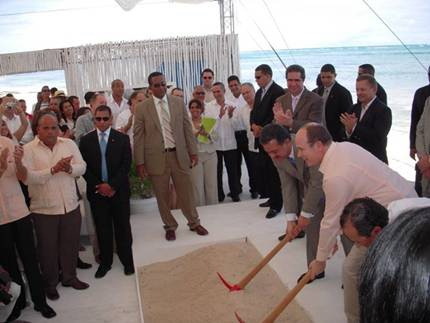 How much did Prince Albert of Monaco and President Leonel Fernandez get for promoting the re-opening of Punta Perla? This arrest warrant also includes the Punta Perla land, bank accounts and other valuables in his name or the name of Paraiso Tropical. Finally the truth will come out and unfortunately hundreds of small investors stands lose their money! It should now be clear that the Punta Perla project should never have had the Bentley Awards, neither the support of HRH Prince Albert of Monaco nor the President of the Dominican Republic Leonel Fernandez. Ricardo Miranda Miret have defrauded not only investors in the Dominican Republic, but also in Spain and Morocco! More than six hundred investors has lost an average of USD 100,000 or a total of over USD 60 Million in his three fantasy projects. Where is the money?? Dominican Watchdog was the first whistleblower on the Punta Perla project one year ago. The reason was that all the money taken by real estate agents and Ricardo Miranda was never secured on escrow accounts to protect the investors. Dominican Republic is full of semi-professional real estate agents who will say anything to their clients for a quick buck! Punta Perla proves that estate agents in the Dominican Republic needs to be accredited and insured in the future. They must be forced to protect clients deposits on escrow accounts or they should be held personally responsible! Any further propaganda or undocumented spin from Ben Potter’s forum, Mark Andrews or related real estate agents about Punta Perla will be posted on the Ricardo Miranda Miret domain with special comments to warn investors. We can either say that the photo with HRH Prince Albert of Monaco and Leonel Fernandez promoting Punta Perla was a great mistake of personal judgment from two such important persons, or we can speculate that they where paid well to marketing an event which made it possible to defraud even more investors into Punta Perla. See the arrest warrant posted on www.RicardoMirandaMiret.com – It will be interesting to read the next newsletter from Punta Perla……., and maybe we could now have the television show back which was deleted 2 months ago, because it was exactly talking about what is happening right now with Ricardo Miranda and Punta Perla! This entry was posted in Uncategorized and tagged ben potter, HRH prince albert of monaco, mark andrews, president leonel fernandez, punta perla, real estate, ricardo miranda miret by admin. Bookmark the permalink. nunca pence que el sr. miranda sea un estafador solo que en r.d. hay que tener padrino y ser enchufe del que esta en el poder para que corra un proyecto. solo son buenos los de amigos del secretario. …no seas ingenuo tim, que tu no lo hayas pensado no quiere decir que no lo sea, un estafador, tu solo preguntale a sus empleados y a sus inversionistas. el proyecto no “corrio” por culpa de no tener amigos pues contaba con el presidente y con el principe carlos, el proyecto no corrio porque miranda es un fantasma y porque todo el asunto es una gran estafa.